Send a positive message to the world with this MALA Cap (Make America Love Again) - Available in two sizes and in Red or Black. Spread LOVE (not hate) with this super soft, fitted and comfy AF t-shirt that was made just for you. It's American Apparel so you know its SOFT and it was made right here in the USA. Available in several colors! Spread LOVE (not hate) with this super soft, fitted and comfy t-shirt that was made just for you with a slightly lower neckline than a classic t-shirt. If you’re a BOSS AF entrepreneur, business owner or just a cool human needing a bold fashion statement this is for YOU! Available in two sizes with an elastic stretch band. Comfy AF! Fitted, comfortable, and soft – this BOSS AF (Deluxe Crown Edition) Black T-Shirt was made just for you. 100% fine jersey cotton. Double stitched. Made in the USA! Protect yourself from the elements and make a BOFF AF fashion statement with this piped fleece jacket. It's pre-shrunk to last a long time and will easily become a favorite in your wardrobe. Fitted, comfortable and soft – this t-shirt was made just for you. Simply put, it’s the ultimate fashion statement! 100% fine jersey cotton. If you’re a BOSS AF entrepreneur, business owner or just a cool human being needing a bold fashion statement this snug, form-fitting beanie is for you! 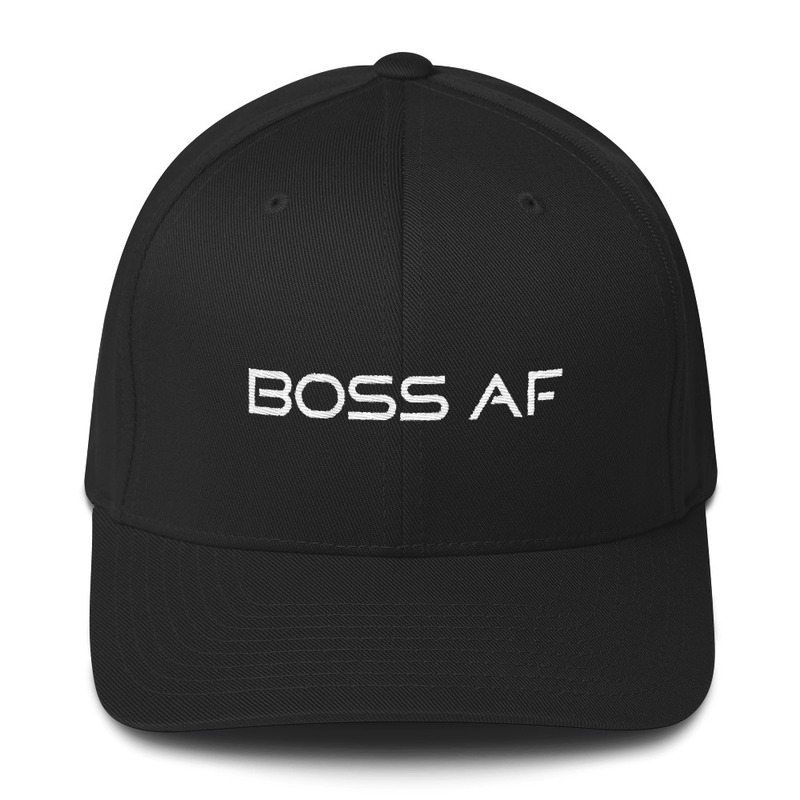 Available in 6 colors to suit your Boss AF mood! Get through the cold season in super BOSS AF style with this insanely soft, classic everyday unisex California fleece sweatshirt with a traditional raglan sleeve. 100% California fleece cotton. This semi-fitted women's polo shirt is just the right mix of relaxed and sporty for a BOSS AF business meeting or brunch with friends. And the stylish embroidery stating who you are will definitely turn heads! 100% pre-shrunk ringspun cotton double pique knit. 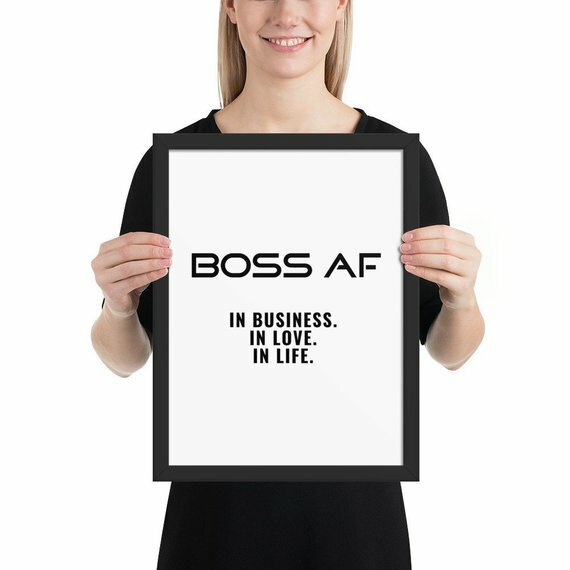 Want to add a splash of BOSS AF to your home or office? This premium feel moisture-wicking pillow with a shape-retaining insert is just what you're looking for! It'll make any room luxurious and provide the perfect excuse for a quick power nap. This comfortable bodysuit declaring to the world that your baby is BOSS AF will be a great addition to any their wardrobe, and features lap shoulders which will make for easier changing.